Over 11,000 convene at Nyanza to remember Tutsis abandoned by UN peacekeepers in the hands of Interahamwe. 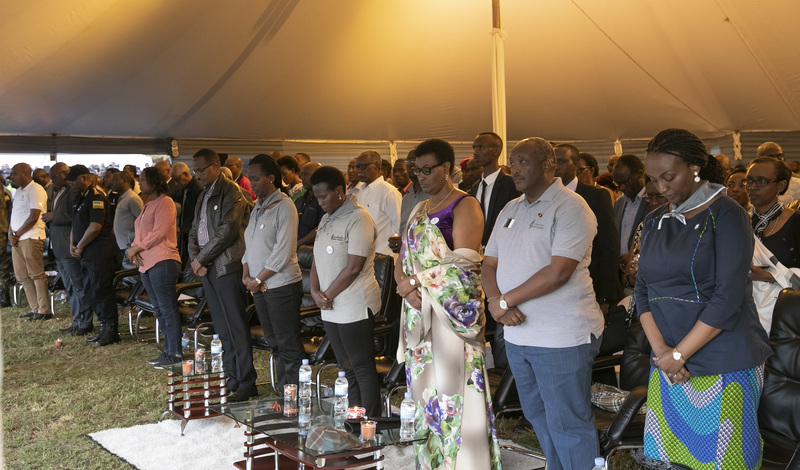 Kigali, 11 April 2019 – Over 11,000 Rwandans and friends of Rwanda convened on Thursday at Nyanza-Kicukiro Genocide memorial, to honour over 12,000 victims of the Genocide against the Tutsi who were killed at Nyanza and surrounding areas, including those who were abandoned by UN Peacekeepers at the former Kicukiro Technical School. The night vigil was preceded by a walk to Remember from IPRC Kicukiro (former ETO School) to Nyanza-Kicukiro Genocide memorial to reflect on the painful march the victims were forced to make before they were slaughtered by the killers. The night vigil was marked with laying wreaths at the burial place, lighting the flame of remembrance, as well as artists performances before listening to the moving testimonies from survivors – Karasira Venuste, Aimable Kaberuka, Speciose Mukayiranga, and Agnes Umwali. The four recounted the terrible killings conducted by Interahamwe and government soldiers at the Nyanza hill until RPA soldiers came and saved a handful of survivors. In his address, Ibuka Association President, Prof Jean Pierre Dusingizemungu, commended continued government efforts to improve the welfare of Genocide survivors. He also thanked different friends of Rwanda for solidarity with Rwandans during the commemoration period and their continued support to Rwanda in the fight for truth, justice, and historical clarity. 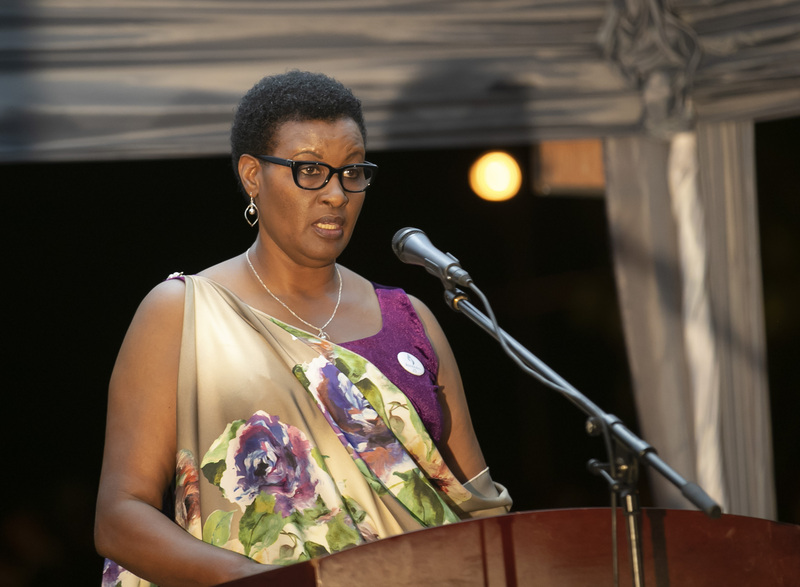 In her remarks, Speaker of Parliament, Donatilla Mukabalisa, reiterated that the commemoration at Nyanza-Kicukiro is a reminder of the failure of the International community where UN peacekeepers abandoned civilians in the hands of the killers, adding that remembrance and recounting our dark history will be done forever for Rwanda’s young people to be aware of their country’s history. “We keep repeating our history for our young people to know what happened in this country. This is not because we want to remain hostage of the history but because out of it, we get the strength to find solutions to our challenges without necessarily waiting for foreign support” Hon. Mukabalisa said. The speaker further noted that while Rwanda has made remarkable progress and presents a promising future, some people were still trying to promote genocide denial. She commended countries that have enacted laws criminalizing genocide denial, urging others to follow the suit. Nyanza Genocide Memorial Genocide tells the story of how UN peacekeepers abandoned Tutsis in Rwanda. The victims buried at Nyanza were Tutsis who sought refuge at the Kicukiro Technical School (ETO. Formerly known as ETO Kicukiro, the Kicukiro Technical School was the base of UN Assistance Mission for Rwanda (UNAMIR). About 4000 Tutsis from different parts of Kicukiro had sought refuge at ETO, seeking for the protection by the UNAMIR troops base. Following the killing of 10 Belgian peacekeepers; on 11 April, UNAMIR troops were ordered to leave Rwanda. Tutsi refugees asked UNAMIR troops commander to stay on site to protect them from Interahamwe. Their request was declined. Young Tutsis kneeled in front of the vehicles, pleading with them to stay but the forces shot in the air and the young men had to run away. The departure of the UNAMIR troops was done simultaneously with the entry of Interahamwe and genocidal government soldiers. Interahamwe threw grenades, fired bullets in the crowd & used machetes/traditional weapons to hack survivors to death. Tutsi from ETO were taken to Sonatube where the Mayor of the city, Lt Col Renzaho, ordered that they instead be taken to Nyanza. In heavy rain, about 4000 starved Tutsi were forced to march to Nyanza as they endured all sorts of persecution. Those too weak to march were killed on the way. Tutsi were taken to Nyanza – which at that time served as a dumping site – to be killed because Sonatube was too visible as it was along the road to the airport. At Nyanza, the militia ensured that no Hutu were among the group by asking everyone to show his ID card. The militia and soldiers shot/threw grenades at the Tutsi. They used machetes to hack to death those who were still breathing. The next morning, they attempted to finish the slaughter but were stopped by the RPA who rescued those who had survived. On the night of 11 April 1994, then RPA soldiers from Rebero rescued close to 100 people from Nyanza.